Higher priority is put on content from people rather than businesses. How does this affect my hotel or business? Valuable feedback on new products and services, in real time. Ranking in search results pages for keywords you use in your social posts. So how do you make sure all of your hard work and content efforts are actually being seen by your fans? Paying to boost posts is a simple way to improve the reach of your content and can be effective for fairly low costs. But if you’re looking to increase your reach without having to pay additional money, a great tactic is using Facebook’s Page Mentions or tagging. Simply put, Facebook tagging means mentioning another business in the content of your posts. This mention hyperlinks to that specific business’ Facebook page and alerts the business that you have tagged them. What are the benefits of Facebook tagging? You may be thinking to yourself, “Tagging gives links to other businesses – won’t this just drive my fans away from me? How does this improve my organic reach?” Contrary to that thought, getting people to click on your post will actually increase your reach. A big part of Facebook’s algorithm that determines how many people see your post is based on engagement. A click on the post counts as an engagement, so the more clicks you get, the more people Facebook will show your content to. Additionally, if you are talking about and tagging other busi nesses for a good reason (like if there is an event happening at a local restaurant and you tag the restaurant), then you are providing more value in your content to your fans. 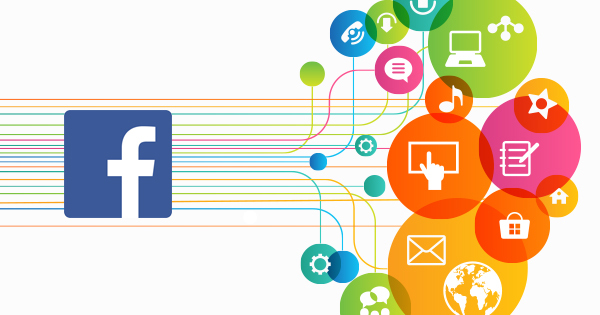 This higher quality post also helps boost your content in the Facebook algorithm. The law of reciprocity is also big on social media. If you tag other businesses (in a relevant way that has value for them), it’s likely that some of them will start tagging you back, giving you increased visibility to all of their fans. What are the risks of hotels using Facebook tagging? As with all posts, if your content is low quality or you are tagging pages that don’t really make sense to the content, then your actions can be seen as spammy by both users and Facebook. Since Facebook is continuously improving the algorithm to strike the right balance of content, you run the risk of decreasing your reach even further. You also run the risk of annoying potentially good marketing partners. If you tag another business without a good reason, they will get notified, and you can hurt your ability to build a connection before it even starts. Facebook posts: action to take right now! If you aren’t currently tagging, make sure you start to include it immediately as a part of your overall social and content marketing strategy. Be smart, tag well, and continue to create strong content that provides value to your end consumers. How can I tag other businesses using a 3rd party tool such as Hootsuite, TweetDeck, or MediaConnect360? Until this year, Facebook did not make Business Page Mentions or tagging functionality available outside of their own platform. Fortunately, the latest version of their API now allows 3rd party tools to enable page tagging. There is a fairly complex approval process that tools need to go through for Facebook to enable this functionality, so as of today, there are only a handful of tools worldwide that support it. 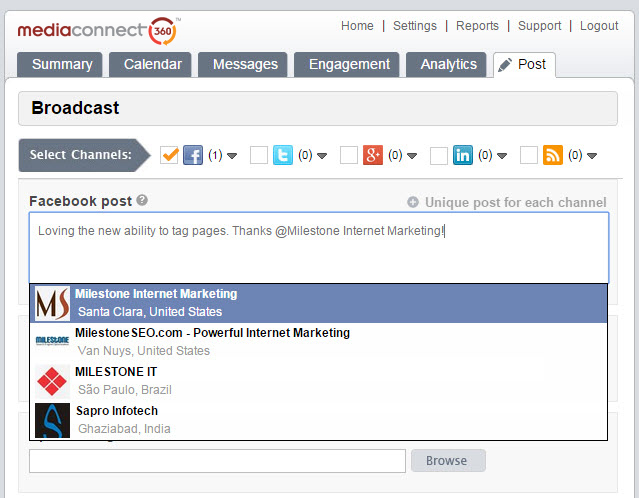 Fortunately, Milestone is among the first to bring this functionality to market, and as of May 13, 2015, our social media content management software tool MediaConnect360 is approved and now supports Facebook page tagging, in addition to Google+ and Twitter tagging, directly within the interface. Below is a screen capture showing how it works, very similar to the native interface you are used to in Facebook. Click here to learn more about MediaConnect360 and sign up for a free 30-day trial! Looking for more tips? 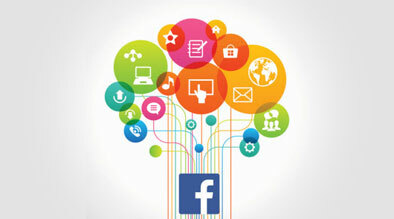 Check out our infographic on Facebook Best Practices for Business. Is it ok, to tag some big Brands while posting??? It is fine to tag big brands while posting, but this should only be done if you have a relevant reason do to so; tagging the larger brand should provide real value to your end users. If you meet this criteria, then it’s a great way to reach a solid audience. If you are tagging big brands for no reason though, your content will likely be marked as spam by Facebook (internally by their algorithm – and without your knowledge) which will negatively impact your potential reach on future comments.